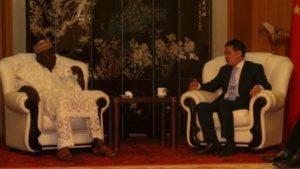 L -R: Otunba Olusegun Runsewe, Director General, National Council for Arts and Culture discussing with Dr. Zhou Pingjian, Chinese Ambassador to Nigeria during the courtesy visit paid on the Embassy. 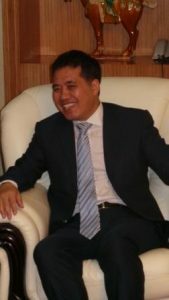 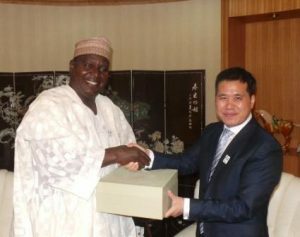 His Excellency, Dr. Zhou Pingjian, New Chinese Ambassador to Nigeria in a happy mood with the courtesy visit. 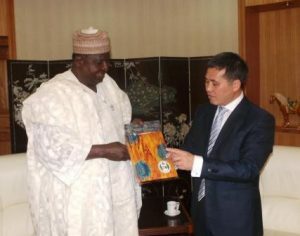 As custom in NCAC, Otunba Runsewe presented some locally made in Nigeria Ipad bags to HE Dr. Zhou Pingjian. 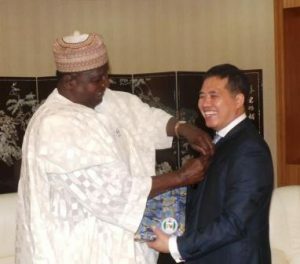 The Chinese Ambassador presenting souvenir to the DG NCAC in reciprocating the gesture of the Council.